On this DVD, Grandmaster Roman Dzinzichashvili examines games that were played with various systems of the Dynamic Reti Opening. This highly instructional and educational material contains many examples of how some quiet and slow opening positions can turn quickly, with flashy and brilliant tactics, which is the trademark of this dynamic opening. 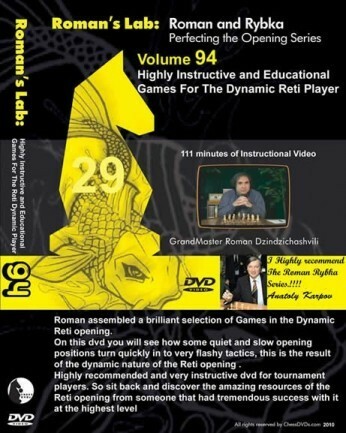 VOLUME 94 - Highly Instructive & Educational Games for the Dynamic Reti Player Grandmaster Roman Dzinzichashvili Over 111 Minutes On this DVD, Grandmaster Roman Dzinzichashvili examines games that were played with various systems of the Dynamic Reti Opening. This highly instructional and educational material contains many examples of how some quiet and slow opening positions can turn quickly, with flashy and brilliant tactics, which is the trademark of this dynamic opening.